The Apple Watch Series 2 comes with a built-in GPS, water resistance to 50 meters, a dual-core processor, a brighter display and watchOS 3. Although the updates are needed and welcome, one of the biggest and most impressive changes came from the watchOS 3. Although it looks largely like its predecessor, the Apple Watch Series 2 has several big hardware upgrades that make it stand out agains its first-generation predecessor. The first and most noticeable change users will notice is the new dual-core S2 processor. Everything is faster from launching apps to using Siri. During an AppleInsider side-by-side test, the first-generation Apple Watch with S1 chip running watchOS 3 took an average of 3 to 5 seconds to open a third-party app. The Apple Watch Series 2 with S2 chip was noticeably faster, in the 1 to 2 second range. Still not an instant opening, but a decent improvement. Another upgrade that will be noticeable to Apple Watch users is the watchOS 3 . It makes Apple’s claim of the user experience being almost an entirely new watch actually true. You can now gain quick access to apps directly from the watch face and the side button can now give users instant access to the dock -- a new feature that cribs from macOS and iOS -- allowing users to pin their most frequently used apps. Apple has said that it will be adding SiriKit on the Apple Watch, and is implementing Theater Mode in the newest watchOS system software. However, it has yet to give an indication as to when the beta will be made available as of late January. SiriKit has been available on the iPhone and iPad since iOS 10 was released. In addition to extending Siri's support for messaging, photo search and phone calls to more apps when paired with an iPhone, SiriKit also adds support for new services, including ride booking and personal payments. "Theater Mode” was first leaked in late-December as a feature for the iPhone, and it appears it will allow Apple Watch owners to disable the “rise to wake” function on the watch, but still notify users with haptic feedback of notifications without illuminating the watch. A subsequent tap on the watch face will wake the watch. Siri has drastically improved with the Series 2. It’s unclear how much of the performance jump is due to the S2 processor and what may be related to the second mic hole on the new hardware, but Siri is definitely faster at addressing queries and more accurate at hearing requests. The new GPS radio in the Series 2 allows pace and distance tracking without a connected iPhone. This means users can leave their iPhone at home when running or biking, and still get accurate data from their exercise. For a more detailed review of the watch's GPS abilities check out the AppleInsider review. In the entry-level aluminum model, Apple has introduced a more durable ceramic back and a second mic hole cutout for better performance and voice recognition with services such as Siri. The Apple Watch Series 2 is also now waterproof for surface swimming and tracking as you swim laps. This is an improvement from the merely water-resistant first-generation model. There are also new swim-specific functions in the Workouts app. The watch also offers a display that is two times brighter than the previous model. Also, users now have the ability to turn on and gradually brighten the display by rolling the Digital Crown upward. In terms of battery life, AppleInsider found it to be on par with the Series 1. Apple estimates the battery life of the watch to be 18 hours, but depends largely on how you use it in your every day life. The Apple Watch lasted for about five hours when using the GPS. The Apple Watch Series 2 also comes in the super luxe Hermes edition with a stainless steel case and Hermes band, as well as the Apple Watch Nike+ and Apple Watch Edition that offers a ceramic case. In a survey performed by Bank of America Merrill Lynch, over 1,000 customers were polled about Apple’s new Apple Watch and of the 8 percent of the total respondent pool who declared that they were planning on buying the Apple Watch Series 2, 70 percent would be new buyers. Apple released the Apple Watch Nike+ in October 2016, a few weeks after the initial Apple Watch Series 2 launch. It is available in 38mm- ($369) or 42mm-wide ($399) models. Nike said this has been in the works since it first partnered with Apple in 2006 for the co-branded Nike+ iPod Sport Kit, a wireless system that connected between a sensor that could be inserted in footwear and iPod. Like all Apple Watch Series 2 models, the Nike+ has built-in GPS that allows athletes to track their pace, distance and route — without the need to bring an iPhone with them during their activities. 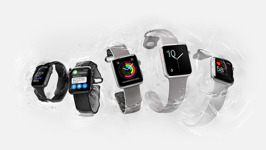 The Apple Watch Nike+ also has water resistance to a depth of 50 meters, allowing it to be worn while swimming. The watch also comes with with one of four different perforated fluoroelastomer bands and has two exclusive Nike clock faces, one "digital" and one "analog," which users can customize. The Nike+ Run Club app is also included, which on top of tracking runs offers social and motivational functions like leaderboards. Shoe and accessories boutique TOMS has also announced a new line of Apple Watch straps featuring woven fabric and leather accents, with each purchase providing one year of solar light to people in need. Apple isn’t stopping with the Series 2 release. The company’s continued hiring of health experts and its takeover of Glimpse, all point to building better electronic health records through the sharing and interpreting health data for both doctors and device owners. There’s also a patent for an Apple Watch invention that enables True Tone display tech by measuring ambient light through a user's skin according to the patent application titled “Ambient light sensing through the human body.” It’s unclear if Apple intends to incorporate advanced ALS sensor functionality into Apple Watch, but it’s something to keep an eye on in the future.